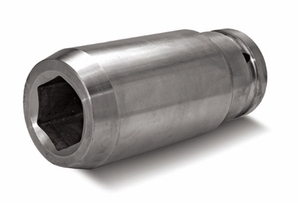 Aldon 4024-191 Steel Hex Sockets: 1-5/16"
Aldon 4024-191 Steel Hex Sockets: 1-7/8"
For 1" sq. drives. Max torque rating 1500ft./lbs. Bolt Clearance depth: 4 inches. Steel socket sizes available in hex or 8-pt. styles, from 1-5/16" to 1-7/8". Made for 1" square drive wrenches. T-Handle wrench recommended when using sockets on tank car manway covers. Product Reviews for Aldon 4024-191 Steel Hex Sockets: 1-5/16"